Truth be told, I wasn’t planning to vote today. And that’s a real shame, because just 14 months ago, voting was an activity I got really excited about. This election just didn’t engage me. I didn’t vote in the primary back in November, and I felt no real attachment to the candidates as we were approaching Election Day today. Frankly, I just didn’t care. And yet, I cast my vote today anyway — less for one of the candidates than against the other. Like many folks, I’ve watched over the last couple weeks as Scott Brown’s built momentum and overtaken the lead from Martha Coakley. I’ve watched his television commercials and received his phone calls — his many, many commercials and phone calls. I’ve seen the people on the street. And the signs. Sure, Coakley had her own ads and made her own calls (believe it or not, I actually received one as I was writing this), but Brown had more. (He even had a better social media strategy.) And in fact, Coakley didn’t have much at all and that was a big part of her problem. I never found a really good reason to support her. But the more I saw and heard and learned about Brown, the more effectively he campaigned, the more I began to want to vote against him. 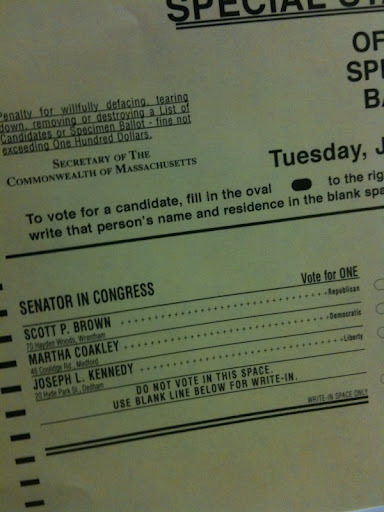 As I filled in the box next to Martha Coakley’s name on my ballot tonight, I thought about how sad this election was. Ted Kennedy, the man who held this Senate seat for so long and who did so many great things for this country and the state of Massachusetts, didn’t deserve for his successor to be chosen by people like myself who aren’t committed to the candidate and are merely voting along party lines out of obligation more than anything else. People who are so annoyed by the calls and the ads that they’re voting against a candidate more than they are for a candidate. Alas, that’s what I’ve done. So thank you to Scott Brown and Martha Coakley for making this election not very fun at all. I hope one of you loses.